A 6 or 12 month smart rental protection warranty covers loss of rent up to £3000 per month and legal expenses authorised or incurred by FCC Paragon, including court costs to obtain vacant possession after no-payment of rent. A 6 or 12 month smart rental protection plus warranty covers loss of rent up to £3000 per month and legal expenses authorised or incurred by FCC Paragon, including court costs to obtain vacant possession after no-payment of rent. However, unlike the standard warranty, the plus warranty provides cover for the first month's unpaid rent, meaning there is no exclusion period. A 6 or 12 month superior rental protection warranty covers loss of rent up to £4000 per month and legal expenses authorised or incurred by FCC Paragon, including court costs to obtain vacant possession after no-payment of rent. However, unlike the standard warranty, the plus warranty provides cover for the first month's unpaid rent, meaning there is no exclusion period and covers legal expenses for eviction proceedings following the correct issue of Section 21. Buildings Insurance covers the structure of the property and any permanent fixtures and fittings, such as kitchen units and bathroom suites, as well as garages and outbuildings, against insured perils such as fire, lightening, explosion, earthquake, malicious damage, storm or flood, theft, subsidence, and breakage of glass or sanitary ware. £10,000 contents insurance and £2 million legal liability cover are included free of charge, with the option to increase the limits for a small fee. Contents Insurance covers furniture, carpets, furnishing and household goods for which are contained in the property, and provided for the use of your tenant against insured perils as above. Contents only cover can also be provided for flats - please contact us for a quotation. Loss of rent cover (up to 20% of the sum insured) should the property become uninhabitable following an insured peril is also included. Contents only cover can also be provided for flats. 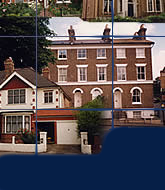 If your property is a house, then buildings insurance must be taken in order to provide a quotation for contents cover. Loss of rent cover (up to 20% of the sum insured) should the property become uninhabitable following an insured peril is also included. © Dove Property Management. 2003.